With the Nooteboom OVB TELETRAILER extendible flatbed semi-trailers any self-supporting long loads, such as concrete and steel structures, can be transported with great efficiency. The hydraulic turntable steering with very large steering angle makes the manoeuvrability of the OVB TELETRAILERS exceptional. Moreover, this hydraulic turntable steering ensures the maintenance costs are very low and tyre wear is kept to a minimum. 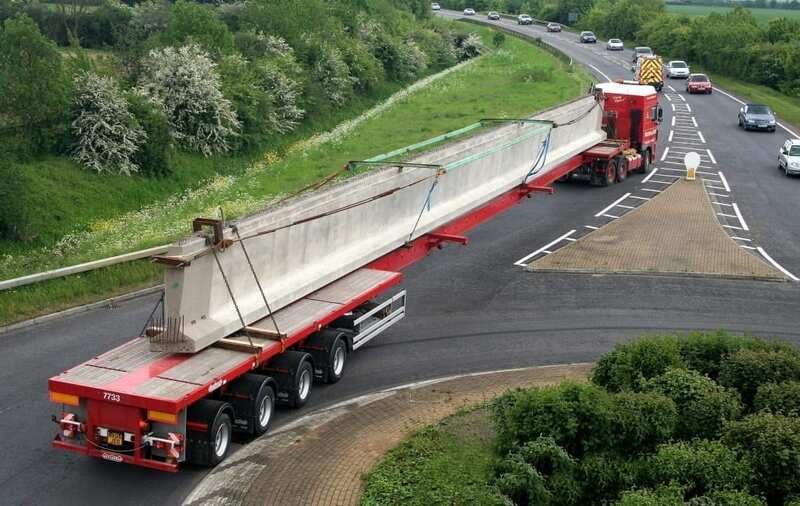 Due to the unique central box-section main beam, made of high-grade steel, the chassis of the Nooteboom OVB TELETRAILER is extremely strong with great torsional stiffness and a low dead weight. In unloaded, extended position the chassis is slightly arched (cambered) to keep any sagging of the load to a minimum. The finish and conservation are top-quality, the chassis is always fully hot zinc sprayed. The hydraulic turntable steering of the Nooteboom OVB TELETRAILER sets the trend in the market of extendible flatbed semi-trailers. Not only the manoeuvrability, but also the precision and wear resistance make the Nooteboom steering system extremely reliable. Together with a long service life and high residual value this results in a low Total Cost of Ownership. Choice of various headboards and storage boxes. The OVB TELETRAILER’s standard equipment includes TÜV-certified lashing eyes and stake pockets.